My intrepid companions! They’re such good sports! The last “Hurrah!” of the summer was a trip to Fort Worth, to see my son, Gerry. Since school is in session already, we had a free day on Friday to go do some touristy stuff, and so we headed to Dallas. We figured we could get in a morning attraction, lunch and and an afternoon attraction before we needed to be back in Fort Worth for dinner. She also provided some input as to why I might be more interested in visiting the place than my children have shown to be. She said “My parents really connected with those events. I guess they lived through them or something.” I guess I did, too! Third grade to be exact. Once again, my Fort Worth-living-son poo-pooed the idea and said we should go see the Perot Museum or the Bush Library (things I have already posted about) and my younger son, who is accompanying us on this trip, wasn’t overtly enthusiastic, but at least game to tag along. My favorite view, driving into Dallas – sort of ultra-modern and futuristic, don’t you think? We drove over on a Friday morning, passing my favorite Dallas view from I-30, and finding the museum easily enough. Tickets are purchased across the street – at least for now. The entrance to the museum was under construction and looks as if one will be able to purchase tickets right there in the near future. We were each given an audio guide and directed to the sixth floor. There may be those of you out there who are unfamiliar with the reference to the sixth floor. I know I was, until I researched the museum as a possible Jetsy essay. 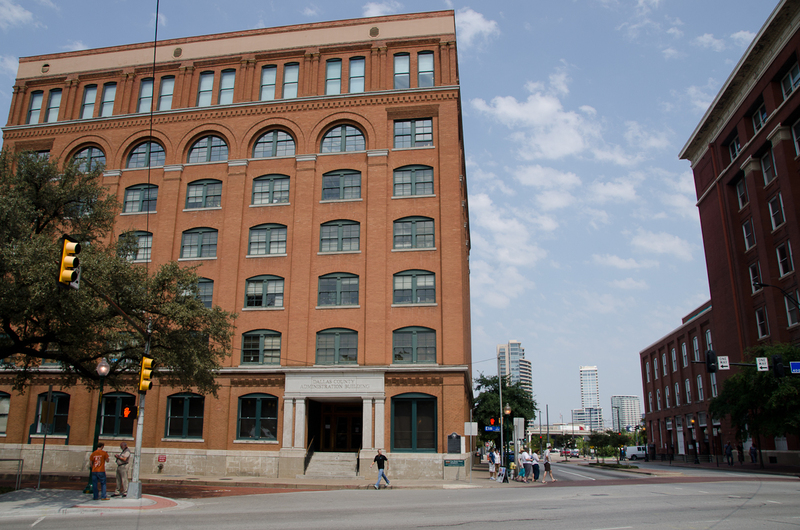 The sixth floor of the Texas School Book Depository building was the location of the shooter, purported to be Lee Harvey Oswald, who killed President John F. Kennedy in 1963. The museum is both a memorial to President Kennedy and an exhibition of the events, the people, the crime and all that surrounds the assassination, including the controversies and the conspiracy theories. The museum is very moving. It is hard not to empathize with the shocked spectators and the grieving family. Seeing the iconic photograph of John-John saluting his father’s coffin in this context gives me goose bumps even as I write about it several hours later. The exhibits are thorough. The stage is set beginning with an explanation of where the country was in the late 50s and early 60s culturally – stable and prosperous, but currents of change already beginning to ruffle the waters from the women’s movement and the civil rights movement. Cuba had seen the overthrow of its government and Fidel Castro was leading the country ever deeper into communism. The American president was young, charismatic, idealistic and ready to rock the boat. Kennedy’s election was decided by just 120,000 votes, denying him the mandate to make changes, just as close elections have in the intervening decades and to the same result. The people were divided, and the even Kennedy’s own Democratic Party was divided. I don’t need to take you through the entire history of the three short years of Kennedy’s presidency, and despite the 50 years of hindsight we now enjoy, some will say the verdict is still out on his legacy. Take it as a challenge to visit the museum and do your own research to arrive at your own conclusions. Fascinating touches to the story line are the CSI inspired exhibits establishing guilt for the crime and providing us with the details. The “pristine bullet”, trajectories, audio tracks and more are all pat of the evidence that crime investigators used to build the picture of what happened and who did it. The museum is just a little confusing in the layout, my audio guide was quite difficult to manage, and there are many times that you are herded into very small spaces that tend to get crowded, but all of those little inconveniences fade in the light of the story that unfolds. The handsome prince with the beautiful princess, a delightful young family, championing the arts and public service from the nation’s highest office, brought down suddenly and unexpectedly, shattering the national illusion of good and better things to come. A fairy tale, to be sure. About where the shadow falls ( amd mind you these trees were not this size 50 years agi, is where JFK was hit by the sniper’s bullets. 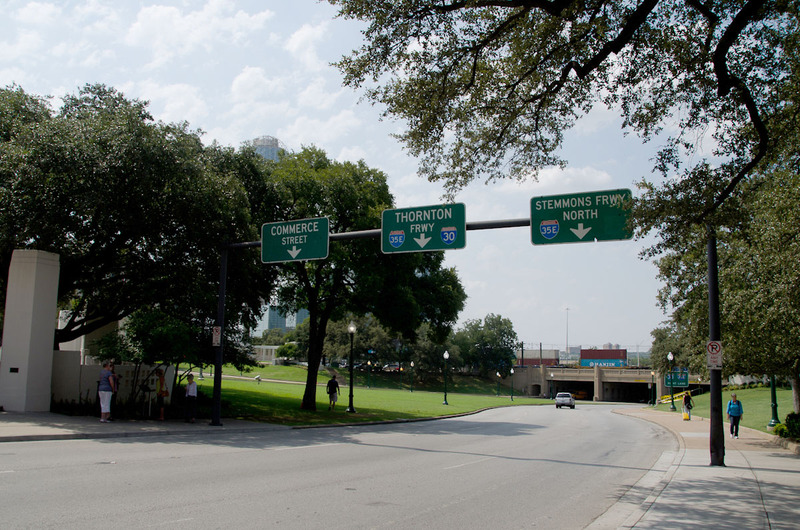 The “grassy knoll” is to the right. Once again, I was left with complicated feelings, gendered by the distance of history and memories of my childhood. My family was staunchly Republican and no fans of President Kennedy. I remember a feeling of shock when I left school that day, and annoyance that the entire weekend (which I spent at the farm) was just one long TV program about the assassination. Selfish, even at 9, I had no idea what the events of that day meant. Like the Bush presidential library and Museum which I saw earlier this summer, this is a place to museum to savor. If you do not come away with a deeper appreciation of the presidency, please let me know. Looking at history, and re-examining the events, you get the sense that we really do live in an extraordinary country, a country that is expected to step up to every threat and respond with grace. Definitely visit this museum! Once we found the place, which entailed driving to the address despite what Google Maps was saying, it was easy enough to park. Definitely an Hispanic neighborhood, filled with other taco eateries and with such a sense of having once been a more thriving neighborhood,we hesitated but still decided to give it a try. Inside, the décor was, well … eclectic? cobbled-together? not-quite-sure? to the extent that I wondered aloud if it was intentional or transitory! It appeared as if a wall had been torn down between two unrelated buildings. The walls were bar, but the furniture matched. One side had a tin ceiling, the other – I can’t remember! The place was dark, and deserted, but for one other table. We went and sat where the too small curtains were letting in the sun of what was a hot, hot day outside. Beauty and grace in one gorgeous package! The menu looked good! No alcohol license yet so a cold beer was out of the question, but we opted for home-made lemonade. We ordered the large plate of fish tacos and the crab hush puppies. These were served with a huge platter of red beans (not Puerto Rican style) and rice. Altogether, it was way too much food for three people! We left the rice and beans (spoiled by the Puerto Rican style we are used to) and focused on the tacos and hush puppies. There was not enough crab in the hush puppies for me (but they disappeared rapidly anyway). The fish tacos though were superb! Big fried flour tortillas, filled with fish and lettuce, and avocado and topped with an aioli sauce that was great. A very good lunch, we all agreed. 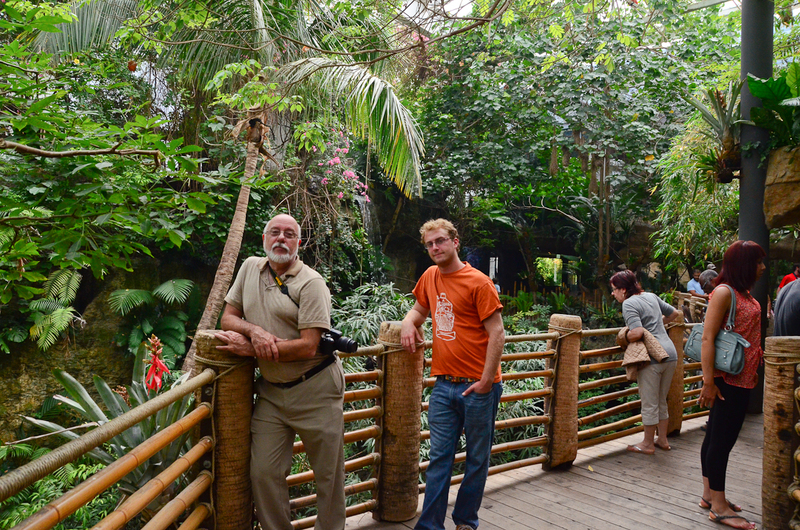 Next up, the afternoon’s destination was a visit to the Dallas World Aquarium. Creatures in the rain forest! This was my second trip, and though I found it a little worn compared to the first visit, it is still a wonderful place. Aquarium is a bit of a misnomer. 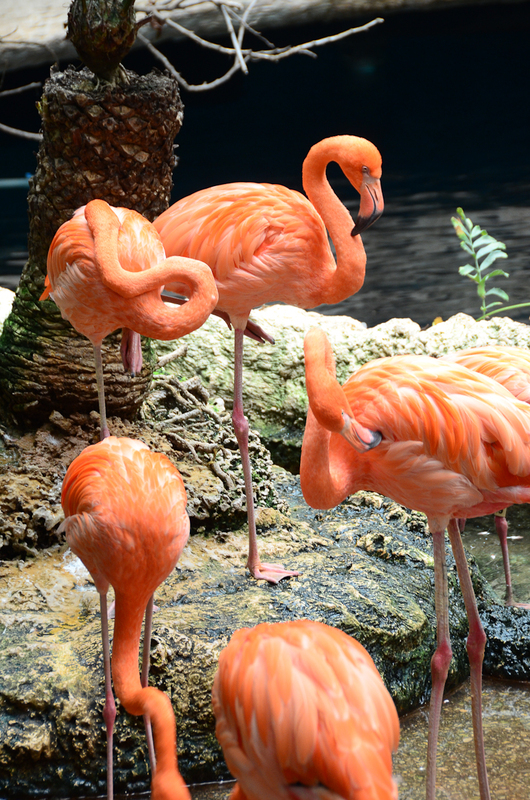 Mostly you would expect to find fish and water creatures, but this aquarium is mainly organized around two water themes: The Mayan World of the forest and jungle and the Orinoco River. There are also areas of the aquarium set up for Borneo, South Africa and a traditional aquarium with underwater life. 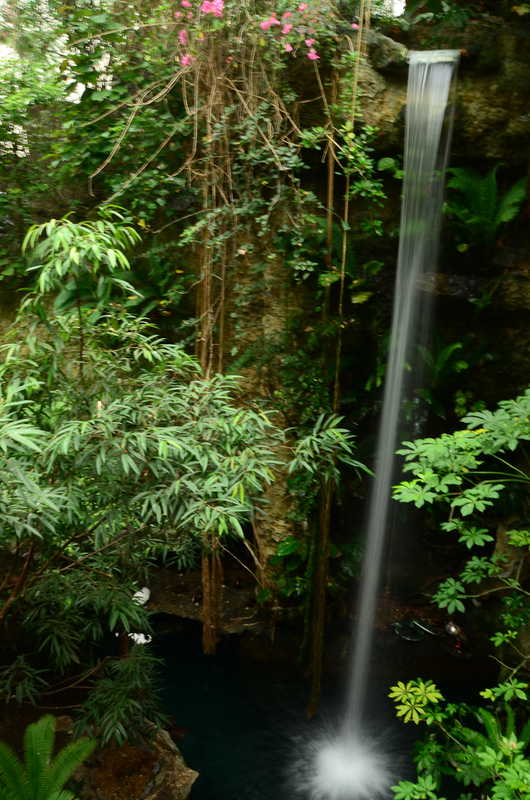 In the Orinoco Exhibit, this waterfall falls several stories. I found the aquarium wonderful on my second visit, too. Perhaps you have to love animals, as I do, to really get the most out of the aquarium and to go more than once. 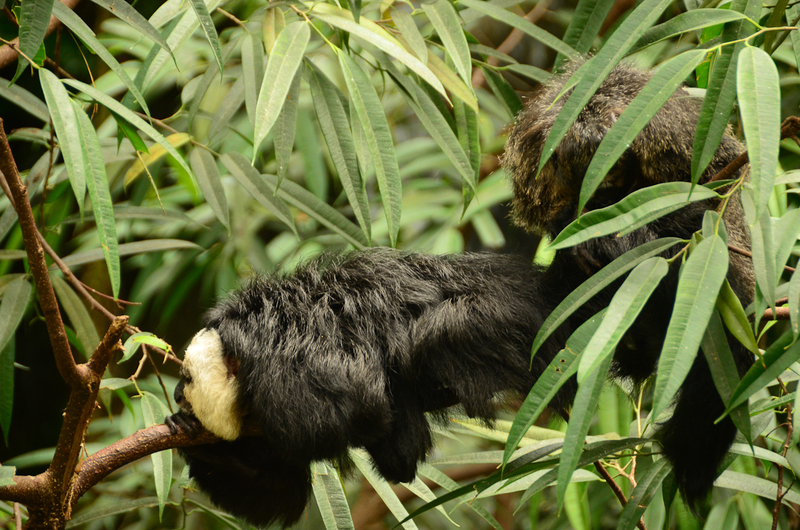 But if you have never been, I recommend you go just to marvel at the Orinoco Exhibit. I have seen nothing like it before. 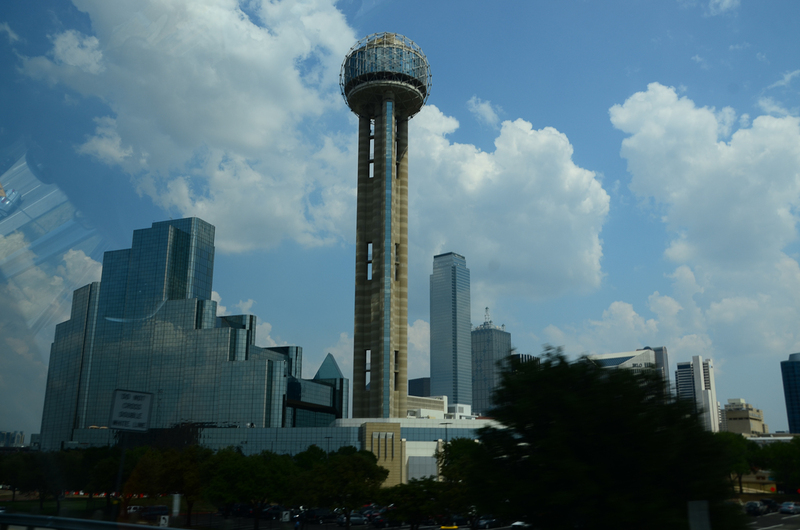 All in all – a worthwhile day trip to Dallas! There are birds galore. 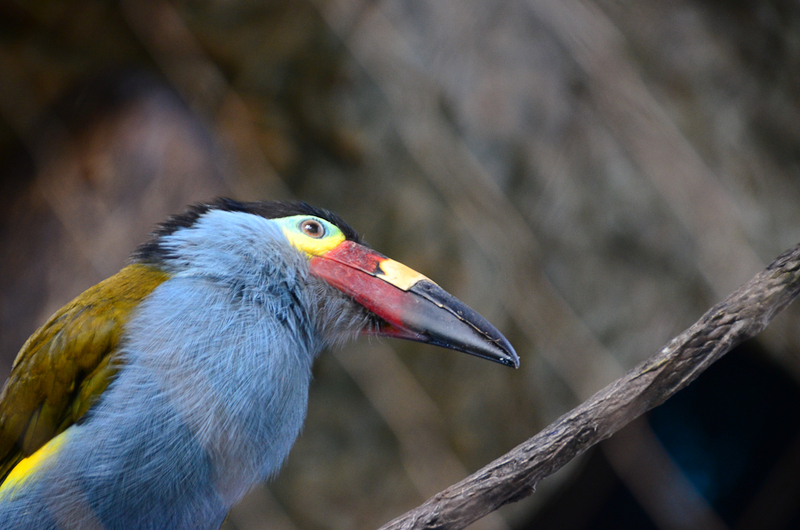 If you love birds, this is the place! Jellyfish tank. 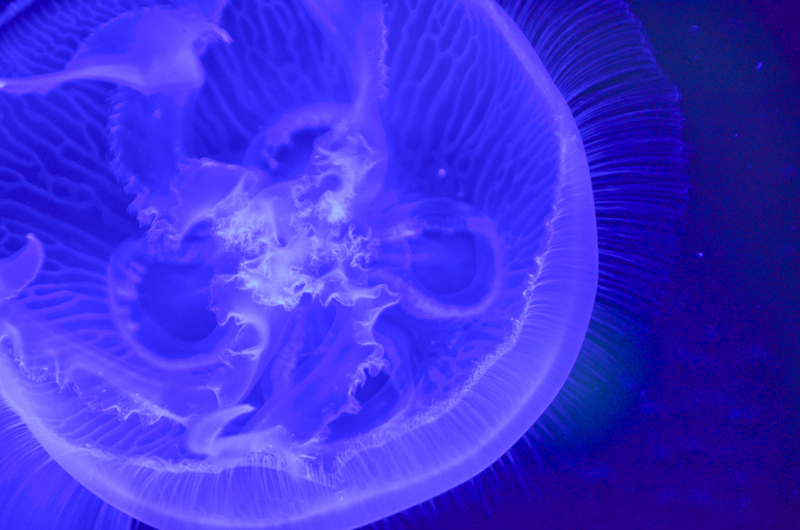 Beautiful in the black light. Not a face! 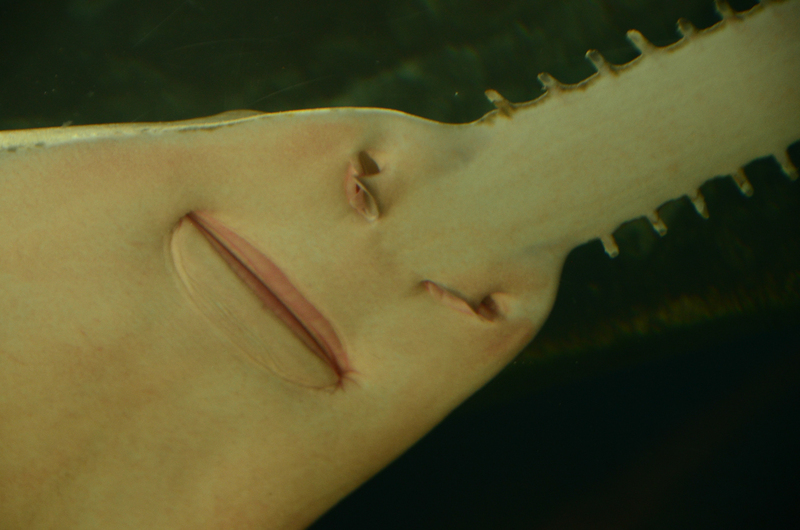 Just the nose and mouth of this shark!